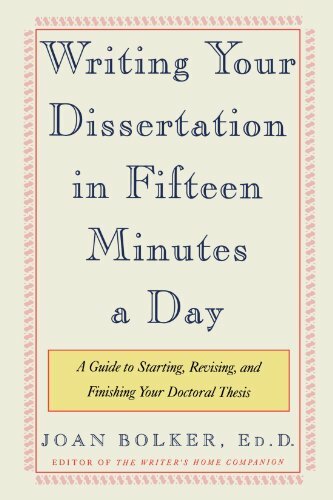 Expert writing advice from the editor of the Boston Globe best-seller, The Writer’s Home Companion Dissertation writers need strong, practical advice, as well as someone to assure them that their struggles aren’t unique. Joan Bolker, midwife to more than one hundred dissertations and co-founder of the Harvard Writing Center, offers invaluable suggestions for the graduate-student writer. Using positive reinforcement, she begins by reminding thesis writers that being able to devote themselves to a project that truly interests them can be a pleasurable adventure. She encourages them to pay close attention to their writing method in order to discover their individual work strategies that promote productivity; to stop feeling fearful that they may disappoint their advisors or family members; and to tailor their theses to their own writing style and personality needs. Using field-tested strategies she assists the student through the entire thesis-writing process, offering advice on choosing a topic and an advisor, on disciplining one’s self to work at least fifteen minutes each day; setting short-term deadlines, on revising and defing the thesis, and on life and publication after the dissertation. Bolker makes writing the dissertation an enjoyable challenge.